On 13 January 2013 the High Resolution Stereo Camera (HRSC), operated by the German Aerospace Center (Deutsches Zentrum für Luft- und Raumfahrt; DLR) on board ESA's Mars Express spacecraft, imaged the mouth of the Tinto Vallis region of Mars, southwest of Palos Crater. Tinto Vallis, named after the famous river located in the Andalucía region of Spain, is 190 kilometres long and believed to have formed around 3.7 billion years ago, during Mars’ early history. Its formation is thought to be the result of volcanic activity, which melted subsurface ice. 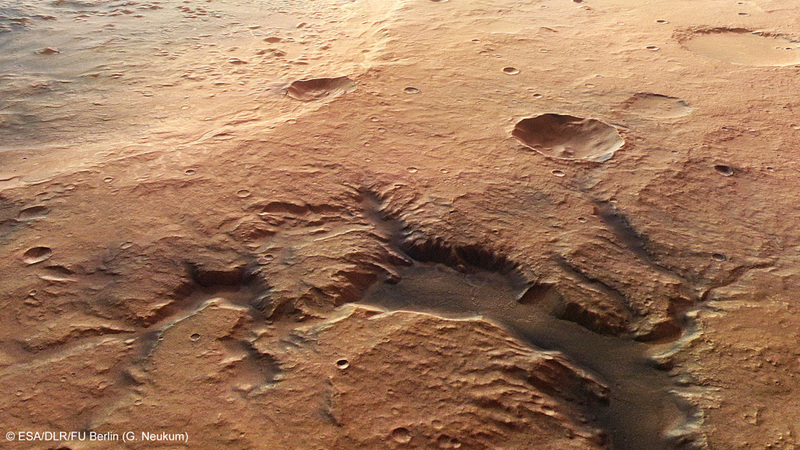 As a consequence, groundwater was liberated to the surface of Mars and what are known as ‘sapping valleys’ formed. Groundwater sapping is believed to be responsible for the erosion seen in many of the valley networks on the red planet and is the process whereby water comes out of the ground laterally as seeps and springs. This results in slopes being undermined, undergoing mass wasting, forming steep ‘U’ shaped valley structures. Sapping valleys developed all over this region due to soil erosion, with a clear example being the mouth of Tinto Vallis, seen in the lower centre of the two-dimensional colour, topographic and anaglyph images. Also of note in the aforementioned two-dimensional images and the striking second perspective image (1), is a 100-kilometre-wide crater that dominates the southern (left) half of the two-dimensional images. A smaller 35-kilometre-wide crater is superimposed onto it. 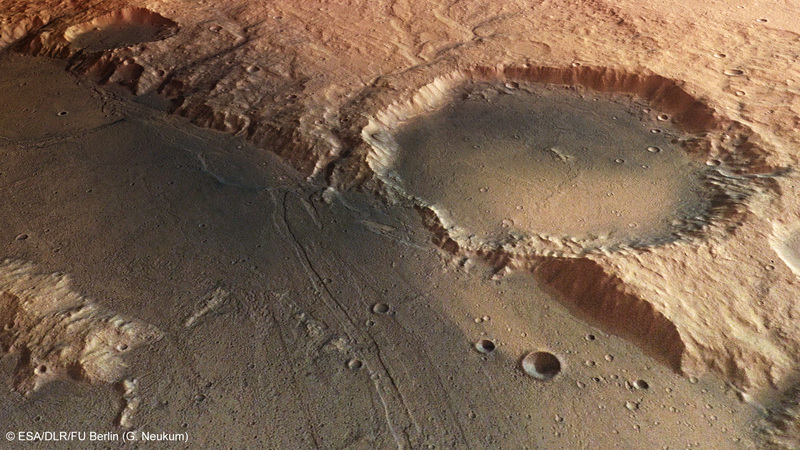 The floor of the 100-kilometre crater is chaotic, littered with mesas and their smaller siblings, buttes. These are probably the result of the removal of subsurface water ice, which lead to the collapse of the surrounding surface, leaving these high-sided features behind. Buttes and mesas owe their sheer sides to thicker layers of more resistant rock within them. On Earth, we can find many examples of these types of formations in the desert regions of Utah. Within the 35-kilometre crater, and most notably seen in the second perspective image, are spectacular landslides towards the northwestern and northeastern sides. Toward the north (right) side of the two-dimensional images, several smaller craters display very smooth and flat floors, which are due to infilling by sediments. The darker regions to the far north and south are low-lying areas, covered in wind-transported basaltic sands. With these recent images, Mars Express continues to show the similarities between regions on Earth and those on Mars, and how the two worlds’ early geological history is subtly intertwined. 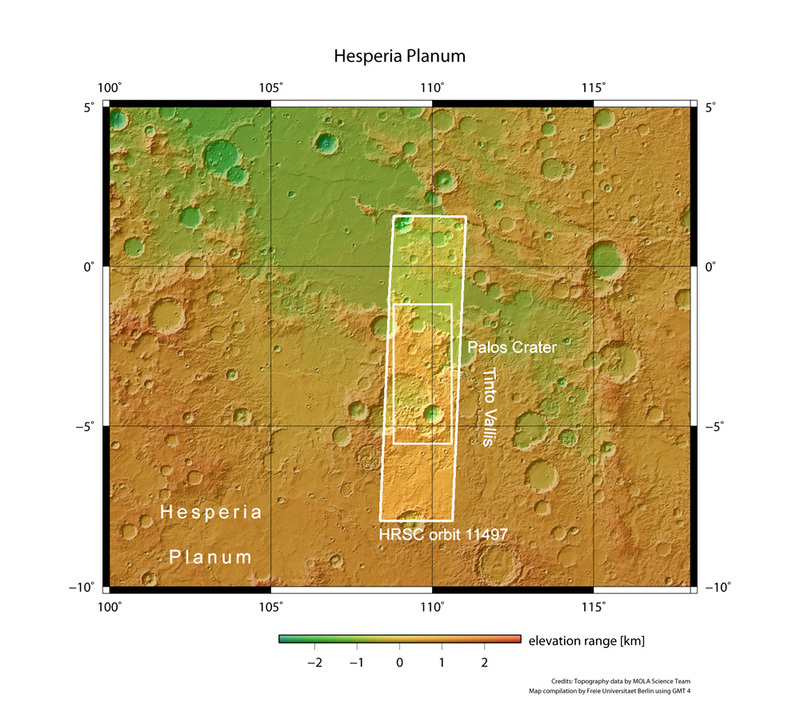 The colour plan view (4) was acquired using the nadir channel, which is directed vertically down onto the surface of Mars, and the colour channels of the HRSC; the perspective oblique views (1 and 6) were computed from data acquired by the HRSC stereo channels. The anaglyph image (5), which creates a three-dimensional impression of the landscape when viewed with red/blue or red/green glasses, was derived from the nadir channel and one stereo channel. The colour-coded view (3) is based on a digital terrain model of the region, from which the topography of the landscape can be derived.